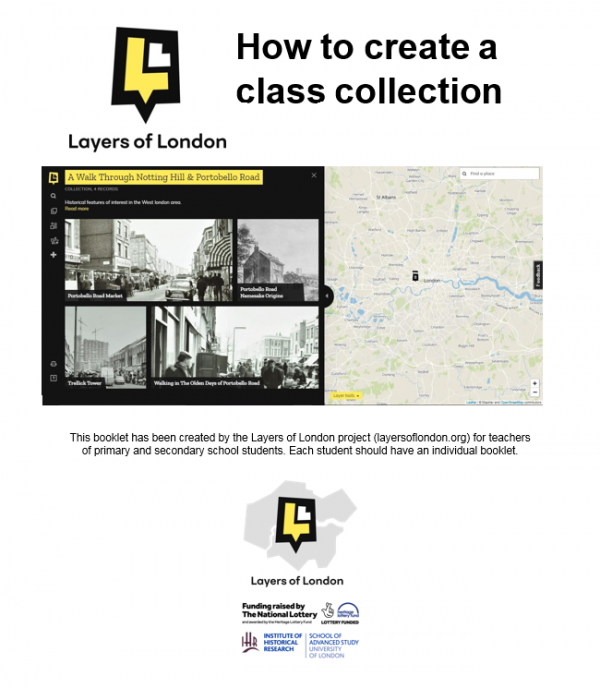 Layers of London has created free teacher and student packs to support Key Stage 2 and 3 students and help teachers create their own class collections. Layers of London is a project that aims to engage with hundreds of thousands of Londoners from and provide them with the tools to explore and share their histories and identities through our state of the art website. The website is a platform through which Londoners contribute to developing a record of our diverse city, using layered historic maps as a base upon which to record hundreds of thousands of stories, voices, perspectives, memories, and histories. Members of the public are able to peel back the layers of London’s history and explore interactively the story of London’s remarkable, diverse and sometimes turbulent history over 2,000 years and its evolution into the city it is today. These free resources walk students and teachers through the process of researching, choosing, discussing and creating their own class collection on the website, allowing classes to publish and share their local history work online and help contribute to an exciting and pioneering London history crowd-sourcing project! The student booklets can be worked through independently by students at their own pace and includes interactive, research and group work activities. The teacher booklet is an annotated version of the student booklet with extension task ideas and discussion topics and clear links to the national curriculum. The teacher resource is designed to support teachers whilst using the website and to try and minimise the preparation needed by teachers beforehand. Layers of London also offers free 1 hour CPD sessions for schools who would like extra support for staff using the Layers of London map, you can book these by contacting the Layers of London team. The Layers of London team have also developed an ESOL booklet for students to help exercise English language skills while learning about markets in London. Students will discuss the topics of markets, compare and contrast markets in different countries and different types of market and exercise using new vocabulary for this context. Students will practice key questions and phrases in pairs and complete comprehension tasks to assess their learning. Students will then all use Layers of London to explore London markets and their local market through the various crowd-sourced history, memories, stories and media. This resource culminates in a class project to interview their local stall-holders about their jobs and their work. To explore Layers of London and learn more, visit www.layersoflondon.org.